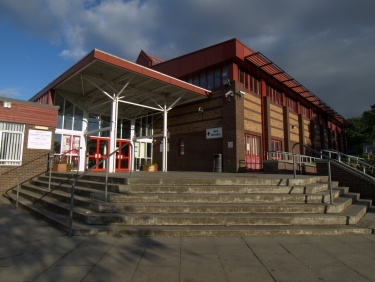 Queensferry Community High School is a 750-strong six-year comprehensive school offering a quality education for young people and adult learners. It also has recreational facilities for use by the community in out of school hours. It is one of twenty three secondary schools run by the City of Edinburgh Council. Standing close to the River Forth, the School has commanding views of both the Rail and Road bridges. The catchment area of the School is extensive and covers the primary schools at Dalmeny, Echline, Kirkliston and Queensferry itself. The School was opened by HRH The Princess Margaret in 1970, the 900th anniversary of Queen Margaret's arrival at Queensferry. A new recreation wing was added in September 1995, a further extension in 1997 with a total refurbishment of the rest of the School undertaken in 1998. With these modernisations in place, QCHS represents a modern and well equipped educational institution which is appreciated and utilised by students and the wider community. If you are thinking about enroling your son or daugher in QCHS there may be many questions you need answering. The same applies for pupils who are about to move from primary to high school. This website has been designed to try and answer as many of these questions as possible. If you need to know about any aspect of the Curriculum there is a dedicated site for each subject. Please feel free to browse or use our search engine for specific areas of interest. If you cannot find what you are looking for, please contact the school office on 0131 319 3200.